Subiaco is a charming medieval town in the province of Rome, situated on a rocky hill in the upper Aniene Valley, in an area universally considered as as the cradle of the Western monasticism.The first inhabitants were the Aequi, subdued by the Romans in 304BC: they made great works of hydraulic engineering to convey the waters of the Aniene river to the city of Rome. The Emperor Nero built here a sumptuous villa on the shores of three artificial lakes, called "Sublaqueum" (hence, the place name). Benedetto from Norcia arrived here at the end of the V century: after several years of hermit life, he decided to built 13 monasteries in order to accommodate his followers. The Saracen attacks destroyed all the monasteries, except the one dedicated to St. Scholastica (St. Benedict twin sister) and the one called the Sacro Speco. The Monastery of St. Scholastica became a feudal power: the abbot exercised both the temporal and the spiritual power. After many years of independence, the Papacy gave the abbey in commendam. In 1753 Pope Benedict XIV deprived the abbot of the temporal power. 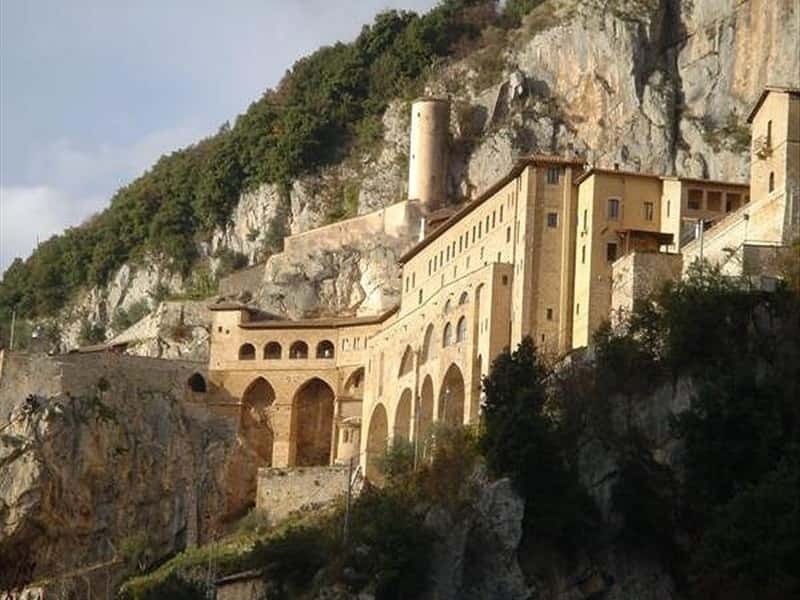 - St. Benedict Monastery (or Sacro Speco), defined by Petrarca "limen Paradisi" (border of Paradise), is a monastic complex consisting of two churches, a cave inhabited by the Saint and several chapels. It is accessible through a Gothic arc and corridor. In the Chapel of San Gregorio is possible to admire one of the earliest portrait of St. Francis, made 3 years before his death, without stigma and halo. The upper Church has frescoes of Sienese school in the first part, and frescoes of Umbrian-Marches school in the second one; the XIV century altar is in cosmatesco style. The Lower Church has frescoes in Byzantine style and paintings by Magister Conxulus. - St. Scholastica Monastery, once dedicated to St. Silvester, is the only survivor of the 13 monasteries built by St. Benedict in the valley. Heavily damaged during the Saracen raids and the II World War, the complex was refurbished several times during the centuries. The motto of the Benedictine rule "ora et labora" is carved on the facade. It is structured around three cloisters: the first one in cosmatesco style (XII-XIII century), a Gothic one (XIV-XV century) and a late-Renaissance one (late XVI century). The Gothic Church with Romanesque style bell tower was transformed in Neoclassic style in the XVIII century. The rich library is very interesting. - the Abbey Fortress, built between 1073 and 1077 by the Benedictine abbot Giovanni V in the highest point of Subiaco. Later it became a cardinal residence. Spoiled of its furnishings by the Napoleon's troops, it is still possible to see beautiful frescoed rooms, the clock tower and the Borgia tower. - St. Francis bridge, of medieval origin (1358), is a donkey back bridge with a small guard tower; it crosses the Aniene river near St. Francis Convent. This town web page has been visited 15,029 times.